Capri by the Sea condominium, beach resort home in Southern California. This Two Bedroom, One Bath, OCEANFRONT Property includes PANORAMIC OCEAN VIEWS, A Fully-Equipped Kitchen, Microwave Oven, Dishwasher, Seating For Six, Two Color TV's With Cable, Complimentary High Speed Wired AND Wireless Internet Access, Coin-Operated Laundry Facilities, 24 Hour Onsite Security and Caretaker, Outdoor Heated Pool, Covered Designated Parking for One regular sized Vehicle (parking is available for large vehicles and campers or for an additional vehicle for a $25.00 fee), Spa, Sauna, Barbecues, Elevators and a Rooftop Lanai. There is a Queen-Size Bed in the first bedroom, a Queen bed in the second Bedroom and a Sofa Sleeper in the Living Room. 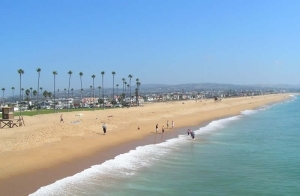 Capri by the Sea Condo Rental in San Diego CA..
San Diego embodies the laid-back California lifestyle, with the famous Boardwalk, surfing communities, and outstanding cuisine. In San Diego, you can breathe in the fresh ocean air at Sunset Cliffs Natural Park, then gobble down a fresh fish taco at a seaside seafood restaurant. The naval aircraft at the USS Midway Museum in San Diego will grab your attention. A free Sunday concert at the Spreckels Organ Pavilion is the perfect way to unwind after a Saturday night at the Gaslamp Quarter entertainment district. San Diego is one of the top-ten best climates in the Farmers' Almanac and is one of the two best summer climates in America as scored by The Weather Channel. San Diego Attractions offer something for everyone.